The simple report tool for your KMG-Lite force test results on power operated doors and gates. Choose a testpoint template for a more specialised PDF report. You can also use the autofill feature to automatically add measurements and limits. Warning: Autofill will clear the current measurements and replace them with the selected template! Upon pressing "Autofill Template" any unsaved changes will be lost. Press the "Reset" button at the end of this page to restore the last saved testpoints. Does your force tester need re-calibration? 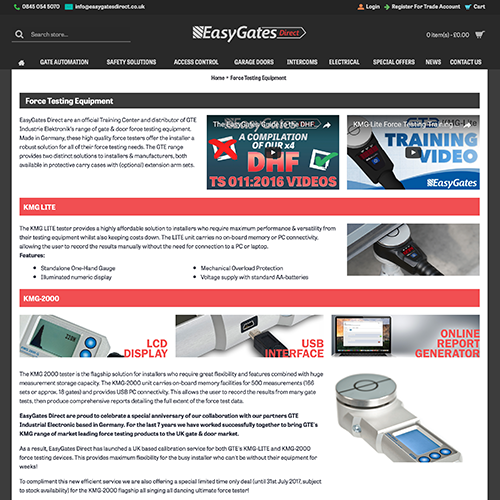 EasyGates Direct has launched a UK based calibration service for both GTE's KMG-LITE and KMG-2000 force testing devices. Simply fill in our Force Tester Calibration form, send us your force tester, and we will calibrate it for you within 2-3 working days of receipt of your tester. Certificate re-issue and return shipping costs are included in the calibration fee. This provides maximum flexibility for the busy installer who can't be without their equipment for weeks! I want to learn more about gate safety in general! I want to learn more about force measurement in particular! What kind of force testers are there? Let me see the KMG datasheets again! Let me see the KMG manuals again! I'd like to buy a KMG! Force limitation is one common way of avoiding crushing, shearing and drawing-in hazards on power operated doors and gates. First click the "Object info" tab control to fill in information about your customer and the gate/door system you are about to measure. Next click the navigation tab "Presets" and enter your name, your company name and the calibration expiry date of your force tester. If you want the force test report to contain your company logo you should upload a graphic file of the logo to an internet-server or find an existing one. Then enter/copy the according URL (Uniform Resource Locator => 'weblink') to the input field "URL to your company logo". In case of doubt please consult your company's website-administrator. After that you may want to save these presets to your browser, so that you don't need to fill them in the next time you use the tool. To do this, please make sure that your browser is set to accept cookies. Click the "Save Presets" button and wait for the disk-icon to become green. Finally you can deal with the force test. Click the "Test result" tab to enter the descriptions of the points of measuring you have chosen, add the according admissible dynamic force limit (EN 12453:2000 A.2.1) and - of course - type in the measured values of the dynamic force (Fdyn), the dynamic time (tdyn) and the static force remaining five seconds after impact (FEnd). To indicate wheather the measured values meet the limits or violate them, choose between the "PASS"- or "FAIL"-statement by click-toggling it accordingly. Additional testpoints can by added by clicking the + (plus) button underneath the third testpoint row. 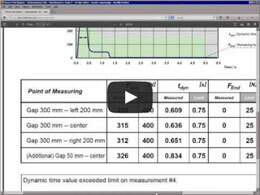 Up to ten points of measuring are supported. To delete one of the extra testpoints, please click the grey X within the according tespoint description field. If you would like to add a free text comment to your report (i.e. to explain the test results to your customer), simply type into the Textarea ("Remarks...") underneath the last tespoint row. Before you can finally create your PDF-Report you may want to save the testpoint description texts and the according force limit values you entered to a browser cookie for further use. To do this, please make sure once again that your browser is accepting cookies and click the "Save Testpoints" button. Wait for the disk-icon to change to green. Now click the "Create Report" button at the bottom of the page. After the creation process is finished, make sure to download or print your PDF-report for it will not be saved. Please make sure that you entered at least one testpoint's complete measurement result. It is obligatory to type in the tespoint description, the Fdyn, tdyn and FEnd values. Make sure that you use an up-to-date internet browser (i.e. Firefox, Safari, Chrome, Opera). If in doubt, please update your browser or download and install one of the before mentioned browsers from scratch. If the tool seems to be working correctly, but your PDF-report won't open, it might be possible that your browser does not contain an Adobe Reader Plug-In. To be sure, please download and install the latest version of the Adobe Reader. If you are facing problems using the "Save Presets" or "Save Testpoints" functions, you might want to check if your browser's privacy settings allow this page to save Cookies. Cookies are a common technology to save small amounts of data within your brower's memory cache. Please consult your browser's documentation. If the problems still occurr, you might want to try a different browser. Install one of the above mentioned and try again. If you have read, understood and tried all above mentioned solution statements, we would kindly ask you to post a detailed bug-report to feedback@easygatesdirect.co.uk. We will then try to figure out the problem and fix it as soon as possible. Thank you in advance for your efforts and our appologies for the inconveniences! A good place to start is the the Door and Hardware Federation's (DHF) publications page. If you are all new to the technical field of power operated gates and you want to gain the qualification to perform installation and maintenance services, you should attend a DHF training course. GTE is currently working on a "Force Measurement Guide", which will cover all necessary information on force testing. As soon as it is published, you will find it here. Until then, you might want to read the above mentioned "Guide to gate safety legislation and standards" by the DHF, for it also includes some info on force testing. 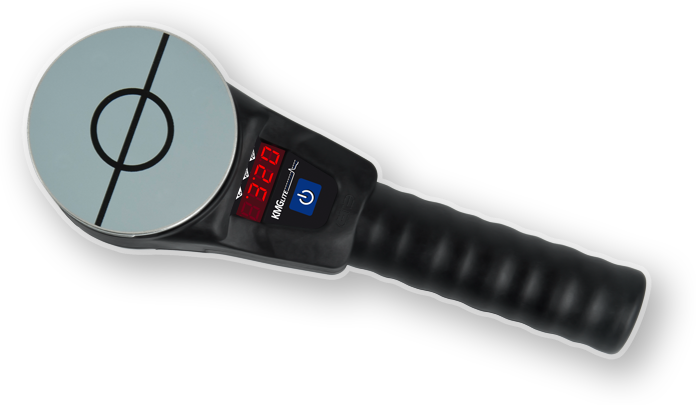 GTE offers two versions of its KMG force tester. The classic version, KMG-2000-G, was designed to meet the requirements of door/gate manufacturers as well as technical experts. It conforms with all specifications defined in BS EN 12445:2000, clause 5. Moreover it is equipped with an internal memory to save up to 500 measurements. Concerning the evaluation it automatically calculates average force and time values of three measurements, forming the test result of a standard measuring point defined in BS EN 12445:2000, 5.2. Its USB-interface allows the user to transfer the recorded data to a PC software for further evaluation and archiving. The integrated graphical display shows the recorded force-time-diagram right away. 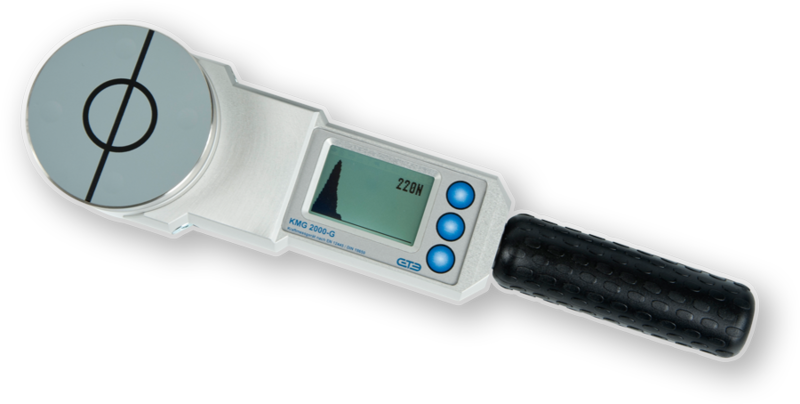 In 2011 GTE launched the KMG-Lite as a simple force tester especially designed for in-situ measurements in the context of scheduled maintenance. It is neither equipped with internal memory nor with a graphical display. Instead it is kept as easy as it gets with just one control key and an numerical display. Therefore it outstands with quick and easy handling and a great value price. For both devices handy spacer sets are available, which cover two standard measuring distances defined in BS EN 12445:2000, 5.2. Choose one of the following datasheets. Choose one of the following user manuals. EasyGates Direct are an official Training Center and distributor of GTE Industrie Elektronik's range of gate & door force testing equipment. 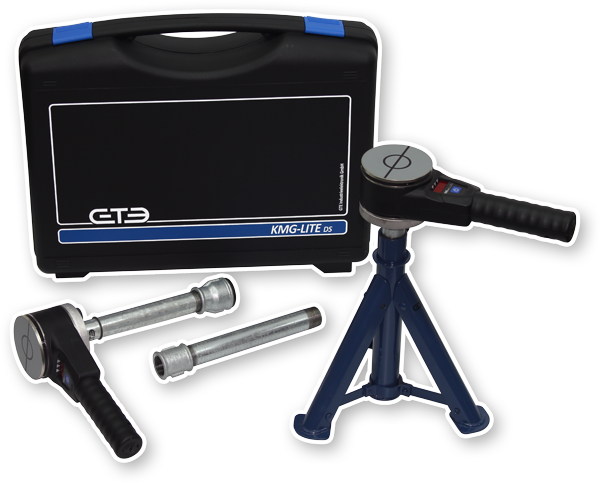 GTE KMG Force Testers and accessories can be purchased from the Force Testing Equipment page on our Trade Store. For prices, please register for an account. Let me speak with someone from EasyGates Direct! * Your browser must accept cookies if you want to use the save-functions!